Having God’s will at the center of everything you do is a cornerstone ingredient to having a supportive spouse in your business and home life. The Holy Spirit will prompt you in big and small ways how you can invite your husband to stretch and grow in his own faith. This was the case for some unsuspecting friends – fathers, and husbands – who happened to be at our house for a barbeque at the wrong or right time, depending on how you look at it. Little did they know what they were about to get in to; they were as vulnerable as lambs. I promise I didn’t premeditate the plot. The Holy Spirit inspired the master plan only 5 hours before our guests arrived. For the past several years, I’ve had the honor of being the leader of Kids for Jesus (K4J), a virtue building program) in my parish and school. It carries great responsibility, but getting to be silly makes helping out with K4J be more fun than burdensome. As part of the K4J School of Virtue, K4J surprises are random, funny, unexpected events that help the school kids joyfully remember and absorb the monthly mission and virtue. They are the “icing on the cake” of the program. I was particularly looking forward to the surprise we had planned this month during the K4J BE A REAL HERO Mission. Being a real hero is recognizing and accepting God’s grace and doing his will. Our “surprise” was to have several adults dress up in superhero costumes. They would crash the kids’ lunch or recess, quizzing them on the definition of a real hero. I was having trouble connecting with the people who had volunteered to help with the surprises. I couldn’t reach the new helpers. Neil, the man who did it last year and recruited them wasn’t responding either. So when I saw Neil handing out tootsie pops with the Knights of Columbus after mass, I cornered him. With leadership comes the need to be sensitive to others when they need to step down from their service roles. Tragically, Neil’s wife had been struggling with cancer. The couple who had volunteered to help were having marital problems. Alas! I felt sad for them. But I also felt sad for me having to find someone else to help. As my family and I were scouring around preparing the house for my two good friends and their families to come for dinner, the inspiration hit me. We could have our husbands dress up as superheroes! While grilling the chicken, I plotted with my girlfriends. They thought it was a hoot. They were in! Since the youngest guest peed on his jeans while trying to potty cut the evening short. Just before everyone left, my friend introduced the super hero idea to our hubbies…. And the guys were up for it! 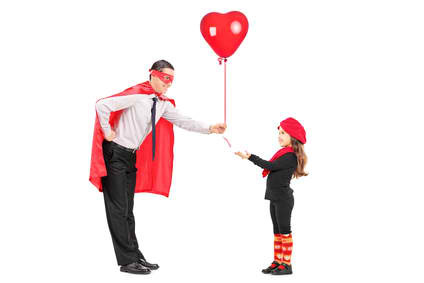 Your spouse can often end up the superhero behind your business. Although they might not be your #1 supporter at first. So how to have a supportive spouse? By continuing to give them attention and the TLC they deserve, while developing a real business that helps reduce his load, often you can win them over. But most importantly, when they see your willingness and effort to make God number one, the shove from the dove (the Holy Spirit) will often push them into your camp. Catholic Mompreneur’s Biz and Life Tip: Take one step today to make your husband feel support. What comes around, goes around.